A New Jersey college student says he was locked out of his iPhone and MacBook for weeks and he believes the person who bought his old iPhone is to blame. Nikolai of Glen Gardner, was selling his old iPhone, but before he put it in the mail, he said he did a factory reset of the device. He said the buyer was not happy with the phone, but instead of going through a dispute resolution process, Nikolai says the buyer was somehow able to access his password and information despite the factory reset and just locked him out of his account. Nikolai spent hours speaking with Apple representatives for help but they could not unlock his phone, mainly because the buyer had accessed his iCloud, and using the “Find My iPhone” feature, declared the phone and laptop as “stolen.” Representatives could not readily ascertain if these devices were indeed stolen or if Nikolai had been hacked, Nikolai said. “I needed this guy, whoever he is, to put in his user name and password, to get my phone and laptop back, but of course, I couldn’t find him and even if I did, he wasn’t going to help me,” Nikolai said. Authorities say Nikolai's story is a cautionary tale for all iPhone users. “Even if you think you have fully erased a piece of information from a phone or other device, sometimes small pieces can be left behind," said Jonathan Voris, assistant professor of computer science at NYIT. Voris says it’s possible that password information was left behind even after the factory reset that allowed the buyer to take control of Nikolai's devices. "The same technology that makes it easier for us to access it could potentially make it easier for someone else to access it as well," added Voris. Cloud hacking has made headlines in the past as media reported celebrities like Kate Upton and Jennifer Lawrence were hacked and personal photos were leaked. There are also videos online claiming to show people how easy it is to hack into the cloud. Apple eventually helped Nikolai unlock his phone and MacBook. 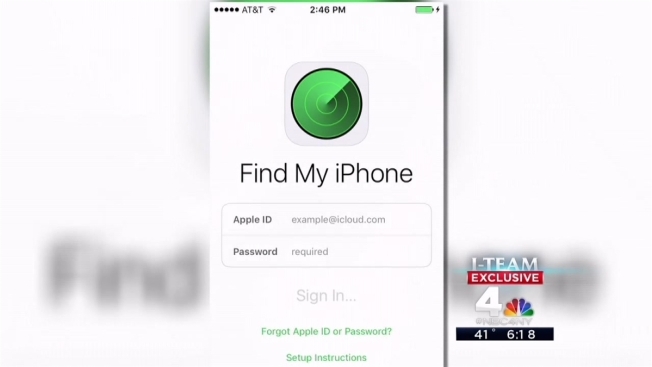 The company said there was one major step he forgot to take before wiping the phone: logging out of the iCloud. Another step users can take, according to professor Voris, is to wipe their phones, add new insignificant data, like a picture or an app, and then wipe it again. It's a lesson that the Nikolai family has learned the hard way. “I will never sell another product with any information on it again, because it’s too much of a risk, ” said Nikolai’s mother, Pamela.